Debris is scattered after Super Typhoon Yutu hit the U.S. Commonwealth of the Northern Mariana Islands in Garapan, Saipan, Oct. 25, 2018. Residents of the Commonwealth of the Northern Mariana Islands braced Thursday for months without electricity or running water after the islands were slammed with the strongest storm to hit any part of the U.S. this year. Even after Super Typhoon Yutu had moved away from the U.S. territory in the Pacific, residents were warned by emergency management officials to stay indoors because downed power lines blocked roadways and winds were still strong enough to make driving dangerous. Gregorio Kilili Camacho Sablan, the commonwealth's delegate to U.S. Congress, said the territory will need significant help to recover from the storm, which he said injured several people. In a telephone interview with The Associated Press from Saipan, Sablan said he has heard reports of injuries and that people are waiting at the island's hospital to be treated. He could not provide further details or official estimates of casualties. "There's a lot of damage and destruction," Sablan said. "It's like a small war just passed through." The commonwealth's emergency management agency was "deploying resources to clear our roadways so first responders can begin assisting residents who have lost their homes and for those who need transport to seek medical attention or transportation to the nearest shelter," spokeswoman Nadine Deleon Guerrero said in a statement. A view shows damages caused by Super Typhoon Yutu in Tinian, Northern Mariana Islands, Oct. 25, 2018, in this still image taken from a video obtained from social media. Sablan said the entire island sustained damage, but there are areas that are worse than others. He has not been able to reach officials on the territory's neighbor islands of Tinian and Rota because phones and electricity are out. "It's going to take weeks probably to get electricity back to everybody," he said. As the storm continues to move away from the Mariana Islands, Sablan said in a tweet Thursday evening that the typhoon warning for Saipan and Tinian was canceled. The electricity on Saipan, the largest island in the commonwealth about 3,800 miles (6,115 kilometers) west of Hawaii, went out at 4 p.m. Wednesday, resident Glen Hunter said. "We probably won't have power for months," he said, recalling how it took four months to restore electricity after Typhoon Soudelor in 2015. "At its peak, it felt like many trains running constant," Hunter, who lives on Saipan, wrote in a Facebook message to The Associated Press. "At its peak, the wind was constant and the sound horrifying," he wrote. Tinian suffered a direct hit. 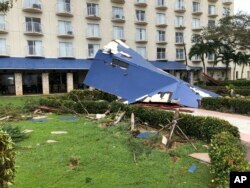 Saipan and Tinian will be unrecognizable, Aydlett said, adding that the weather service received reports that Yutu's catastrophic winds ripped roofs from homes and blew out windows. "Any debris becomes shrapnel and deadly," he said. It was still dark when Hunter peeked outside and saw his neighbor's house, made of wood and tin, completely gone. A palm tree was uprooted. Hunter, 45, has lived on Saipan since childhood and is accustomed to strong storms. "We are in typhoon alley," he wrote, but added this is the worst he has experienced. The roof flew off the second floor of Del Benson's Saipan home. "We didn't sleep much," he wrote to the AP in a Facebook message. "I went upstairs and the skylight blew out. Then the roof started to go. We got the kids downstairs." Recovery efforts on Saipan and Tinian will be slow, Aydlett said. "From around midnight the wind could be heard whipping by," he said in a Facebook message. "Down at the restaurant it sounded like a Hollywood soundtrack with the intense rain and howling wind." Because he was in a solid hotel, it wasn't as scary as living through Hurricane Iniki in 1992, which left the Hawaiian island of Kauai badly damaged, he said. "The fact that we still have internet access proves how solid their infrastructure is," he said. "Hawaii and others should study the Marianas to understand how to design and build communication grids that can withstand a storm."